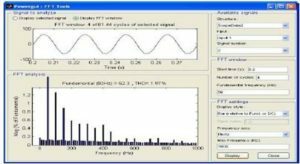 ABSTRACT: This paper deals with the performance analysis of a static compensator (STATCOM)-based voltage regulator for self-excited induction generators (SEIGs) supplying nonlinear loads. In practice, a number of loads are nonlinear in nature, and therefore, they inject harmonics in the generating systems. The SEIG’s performance, being a weak isolated system, is very much affected by these harmonics. The additional drawbacks of the SEIG are poor voltage regulation and that it requires an adjustable reactive power source with varying loads to maintain a constant terminal voltage. A three-phase insulated-gate-bipolar transistor- based current-controlled voltage source inverter working as STATCOM is used for harmonic elimination, and it provides the required reactive power for the SEIG, with varying loads to maintain a constant terminal voltage. A dynamic model of the SEIG–STATCOM feeding nonlinear loads using stationary d−q axes reference frame is developed for predicting the behaviour of the system under transient conditions. The simulated results show that SEIG terminal voltage is maintained constant, even with nonlinear balanced and unbalanced loads, and free from harmonics using STATCOM-based voltage regulator. Fig. 3. Voltage buildup of SEIG and switching in STATCOM. Fig. 4. Waveform of three-phase SEIG–STATCOM system supplying diode rectifier with resistive load change from no load, to three-phase (22 kW), to one-phase (15 kW), to three-phase (22 kW) loads, and to no load. Fig. 5. Waveform of three-phase SEIG–STATCOM system supplying diode rectifier with capacitive filter and resistive load change from no load, to three-phase (15 kW), to one-phase (24 kW), to three-phase (15 kW) loads, and to no load. Fig. 6. Waveforms of three-phase SEIG–STATCOM system supplying diode rectifier with capacitive filter and resistive load change from no load, to three-phase (15 kW), to three-phase (22 kW), to three-phase (15 kW) loads, and to no load. Fig. 7. Waveforms of three-phase SEIG–STATCOM system supplying thyristorized rectifier with resistive load change from no load, to three-phase (18 kW) at 60◦ firing angle, to no load. 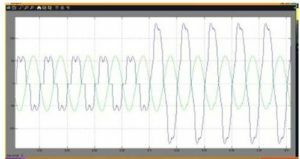 It has been observed that the developed mathematical model of a three-phase SEIG–STATCOM is capable of simulating its performance while feeding nonlinear loads under transient conditions. 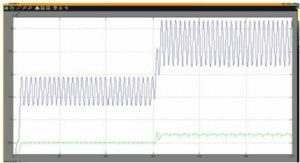 From the simulated results, it has been found that the SEIG terminal voltage remains constant, with the sinusoidal feeding of the three-phase or single-phase rectifiers with resistive and with dc capacitive filter and resistive loads. When a single-phase rectifier load is connected, the STATCOM balances the unbalanced load currents, and the generator currents and voltage remain balanced and sinusoidal; therefore, the STATCOM acts as a load balancer. The rectifier-based nonlinear load generates the harmonics, which are also eliminated by STATCOM. Therefore, it is concluded that STATCOM acts as voltage regulator, load balancer, and harmonic eliminator, resulting in an SEIG system that is an ideal ac power-generating system. C. Grantham, D. Sutanto, and B. Mismail, “Steady state and transient analysis of self-excited induction generator,” Proc. Inst. Electr. Eng., vol. 136, no. 2, pp. 61–68, Mar. 1989. K. E. Hallenius, P. Vas, and J. E. Brown, “The analysis of saturated self excited asynchronous generator,” IEEE Trans. Energy Convers., vol. 6, no. 2, pp. 336–341, Jun. 1991. M. H. Salama and P. G. Holmes, “Transient and steady-state load performance of a stand-alone self-excited induction generator,” Proc. Inst. Electr. Eng.—Electr. Power Appl., vol. 143, no. 1, pp. 50–58, Jan. 1996. L. Wang and R. Y. Deng, “Transient performance of an isolated induction generator under unbalanced excitation capacitors,” IEEE Trans. Energy Convers., vol. 14, no. 4, pp. 887–893, Dec. 1999. The paper presents the structure of an active parallel filter for reducing harmonic pollution and reactive power. The active power filter control is based on instantaneous reactive power theory. The authors present the modelling of parallel active filter based on this theory and the simulation results in MATLAB-SIMULINK. The method is based on instantaneous reactive power (TPRI_P). We considered three-phase system with the balanced voltages and presented the conventional method for determining the current value based on the instantaneous active power which was called TPRI_P. The control is made in the system of axes α – β, which use direct and inverse transformation to obtain the equations from one system to another coordinate axes. The currents obtained in the α-β are related to the alternating current power on the network to obtain the compensation current based on current knowledge of the load, in contrast to the conventional method (TPRI_Q) to obtain the controlled values of currents directly. As can be seen in calculations involved only active powers, perfectly measurable. instantaneous power of the energy source. constant instantaneous power of the energy source. Regarding the homopolar power, network evolution is similar in both cases. * * Software Matlab 6.5. Arad, S., Popescu, F. G., Pană, L. Improving the energetic efficiency at electric drives compressors of E.M. Lonea. Papers SGEM2013/Conference Proceedings, Vol. Energy and clean technologies, Albena Co., Bulgaria , 2013, 153 – 160. Akagi H., Kanazawa Y., Nabae A., Instantaneous reactive power compensators comprising switching devices without energy storage components, IEEE Transactions on Industry Applications, Vol. IA-20, No. 1, May/June 1984, 625-630. Akagi H., Kim H., The theory of instantaneous power in three-phase four-wire systems: A comprehensive approach, Conf. Rec. IEEE-IAS Annu. Meeting, 1999, 431-439.